And, I think his description is generally correct, as far as it goes. But, I'm not sure that demand for money has actually increased that much. 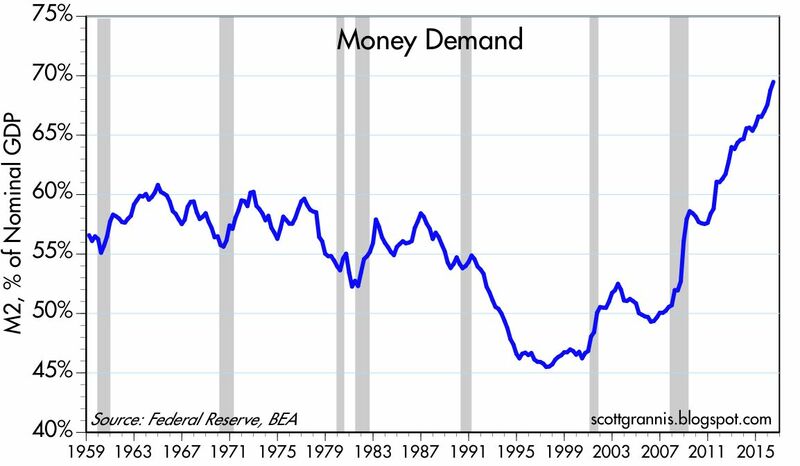 I think, instead, it is more accurate to say that the demand for money has continued to grow at a normal pace, and we have prevented that money from entering the economy in the ways that it normally would have, mostly from shutting down much of the mortgage market. In the M2/NGDP ratio he shows here, it isn't M2 that has been unusual. It's NGDP. M2 has grown between 5% and 8% - basically in the same range as past growth - but NGDP, which also used to grow between about 5% and 8% annually has shifted down to 2.5% to 5%. At the end of 2007, the private securitization market collapsed. But, at the same time, bank lending and GSE lending also levelled out. As I have pointed out, most of the decline in lower priced homes came well after the mortgage market for those areas was practically shut down. Low priced zip codes in places like Texas and Georgia were losing value in 2009 and after, even though they had never been particularly high, especially considering the low interest rate levels. But, interest rates don't matter much if you can't get past underwriting. Interest rates, and relative costs in general, clearly are not the constraint at the low end of the buyer market, and any analysis that pretends such seems to me like an effort to fit the square peg of past housing constraints into the round hole of the current context. From late 2007 to September 2008, the Fed was engaging in emergency lending to banks that were dealing with the liquidity panic in the private securitizations market. During that time, the Fed was "sterilizing" their emergency lending by pulling cash out of the economy. They were basically replacing loans to the Treasury with loans to banks - selling Treasuries and buying bank loans. But, their stock of Treasuries was running low by late 2008, so QE, together with interest on reserves, was basically a switch from sterilizing the emergency loans by removing cash from the economy to sterilizing them by removing credit. Instead of selling Treasuries, the Fed began to "sell" excess reserves, which meant that banks "loaned" cash back to the Fed instead of to a private borrower. Mostly, in practice, this meant not funding mortgages, and the reduction in mortgages was enforced by tight standards from the GSEs and vague threatened liabilities coming from new regulatory pressures. It seems to me that there is a significant amount of profit to be made right now at the bottom end of the mortgage market. So far, most of the profits at the low end are being claimed by institutions buying and renting underpriced properties. I would have thought some form of lending would have developed in spite of the regulatory pressures. I don't know if part of the problem is simply that the destruction in equity that resulted from the collapse in demand that followed the collapse in mortgages has created frictions in that segment of the market. Or, possibly, lenders are just that convinced that low end borrowers are too risky now. Or, possibly, they don't see them as inherently risky, but they foresee continued macro-volatility, which is keeping them out of the risky segments of the market. None of those lender-related issues seem plausible to me. It could be that the constraining factor is the lack of equity. If that is the case, the slow process of time and inflation healing that loss of equity could create positive feedback that creates a boost in housing regardless of how much the Fed tries to pull it back. In the meantime, the cause of the drop in GDP growth is obvious. It's odd how many discussions I see about the mystery of low GDP growth. Rent inflation is rising and we've had an unprecedented decade of a depression in residential investments. This is where M2 should have gone. Instead, the combination of monetary policy and credit policy has prevented it, to great cost for America's middle and lower-middle class households. If they rent, all their growing wages are going to rent increases and if they own, we sucked their life savings into a black hole. No wonder there is frustration. An expanding money supply and credit market will unleash a tremendous amount of pent up pressure for real investment and balance sheet repair, targeted at households with the least wealth, if we can somehow let it happen. The supposed demand for money is a red herring. 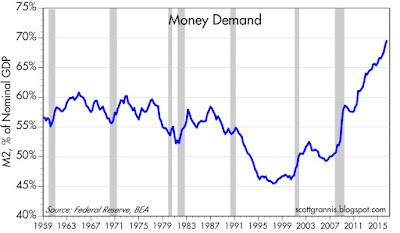 The main demand for money has been coming from the Fed, because we have blocked its natural destination. So, in other words, the "Black Hole" is the excess reserves piled up by commercial banks? To loosen those reserves, the Fed should probably lower IOER which would get the banks making mortgages again. -10 basis point per month until they get some activity flowing. My guess is at about .2% they would see a gusher. Well, at this point, that is functionally equivalent to saying "lower the Fed Funds Rate", which I would agree with. I think this would mainly work through the inflation effect, which would help low income households recover equity that they have specifically been denied, which would create positive feedback and desperately needed real investment. The "Black Hole" is just the decline in asset value that is due to the liquidity premium we have imposed on those neighborhoods. It's like if we passed a Constitutional amendment banning limited liability corporations. The value of productive assets would collapse to account for the required premium, and that would be a real loss of value, because liquidity brings value to an economy, which is reflected in market caps of the corporations. It does happen that, since deposits have continued to grow at a normal pace, the way this played out was through piling up cash in excess reserves. I think the regulatory problems are probably more important than the monetary problems, though. The incredible shift in underwriting at banks and the GSEs isn't constrained by cash. There are plenty of investors who would love to buy GSE MBSs populated with sub-750 FICO borrowers, but the GSEs won't create them. (This has loosened up slightly). Those would be profitable for both the GSEs and investors, and they would be profitable for the borrowers even at higher rates. So, I don't think rates are the constraint here, but it is certainly one leg on the stool. I do not subscribe to the argument that the Fed only swapped reserves for bonds. A simplified version of my view is the Fed digitized money and bought bonds with it, and the bondholders reallocated that cash into savings accounts, property, other bonds, stocks or paper cash. I concur that the policy of the US today appears punitive to lower-income people who seek to own property. Local governments are punitive to lower-income people who wish to start up businesses such as push-cart vendors or truck vendors. Property zoning has created artificial scarcity of housing. The Fed is intent on a crippling tight monetary policy and openly frets that unemployment is too low. Then, we tell poor people not to vote for socialism. You're right. I was probably not clear enough in the post. I agree that there were stimulative/inflationary effects from QE. "bondholders reallocated that cash into savings accounts, property, other bonds, stocks or paper cash." I forgot to add the most simple reallocation, which is to spend the money. QE is a great tool. It even appears to liquidate the national debt. The real question is why would anybody not like QE? Awesome article, Kevin. I have a question. Stephen Williamson says excess reserves are assets and cannot be loaned out. Banks could loan from the base, at 10 times the value of the reserves, but the actual reserves cannot be loaned out. You would think the banks would make more money creating loans than settling for interest on reserves. Any comments from a market monetarist point of view, Kevin? Well, the semantics of reserves are what they are. If the banks did increase credit, reserves would probably shrink because the Fed would sell Treasuries to reduce inflationary pressures. But, I'm no expert, really, so I could be wrong in ways that Stephen Williamson would consider elementary. I don't think profit is the constraining element here. There is probably reduced demand because the equity of low income homeowners has been decimated, and that would be a major source of demand. And, the CFPB and the GSEs are enforcing very tight underwriting standards. There is tons of money to be made there, but I suspect that, to the extent that there is demand in spite of the hobbled balance sheets, bankers fear volatility, whether they see it as intrinsic or as a function of Fed policy, and they are watching a political atmosphere where complaining that more bankers should be in jail is an applause line.